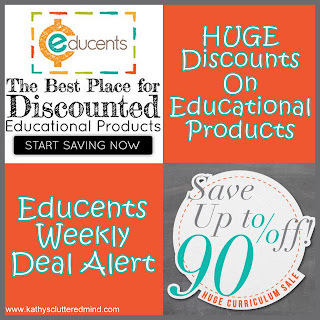 Educents, a flash-deal website, is an easy way to get huge discounts on the educational products you know and love (and maybe even some you've never heard of!) I know I am personally in LOVE with Educents and am always sure to check out the site everyday! Have you seen the product reviews I have done for Educents? If not check them out here. Be sure to check out the $15 Frenzy which started this week. There are some really awesome deals...too many to share them all here! I highly suggest checking out the Bulletin In A Book series from Sunflower Education. The 3 book Bundle (continents, oceans and story elements) is only $14.99. I received these books for review purposes (review coming soon) and they are amazing! Here are this upcoming weeks deals at Educents! Yes you get to see them even before they are released so you can plan ahead. Deal Preview: The Phonemic Awareness For All Learners program is a complete classroom package that is the perfect introduction to reading for your child or student and a great way to build reading readiness. Deal Preview: Languagenut engages students through interactive and colorful games, songs and stories bringing learning a new language to life. Choice of 8 languages. Deal Preview: Whizizzle Phonics is a fast-paced phonics game series that teaches the sounds of the English language. Easier than memorization and more fun than flashcards, Whizizzle Phonics games help kids learn by using sight, sound and color. Math Curriculum Software - This is the math curriculum we already use and love read our review here. Deal Preview: A+ Interactive Math Curriculum CD Software makes learning Math fun and easy by using audio, colorful computer animated visuals and text. It provides ample opportunity to learn using as many real-life situations as possible. Deal Preview: Applecore is a simple online record keeping service designed for the fast paced homeschool parent. You can track courses, grades, attendance, and more all with full reporting from transcripts to report cards. Deal Preview: Encourage and build a strong school and home connection! The Around the Clock Parent Involvement Kits from Newmark Learning are designed to get parents involved in building a solid literacy foundation for their children. **Please note some deals and/or deal information may change before they appear on the website.